Lighting Design- Add it and Jealousy Ensues! Let's get really creative! Draping is the canvas for your imagination's brush! An elegant dance floor enclosure? Yes! An amazing backdrop for your head table? Of course. Cake display of your dreams? Let's do it! Call us and let's dream up some awesome ways to use some draping! 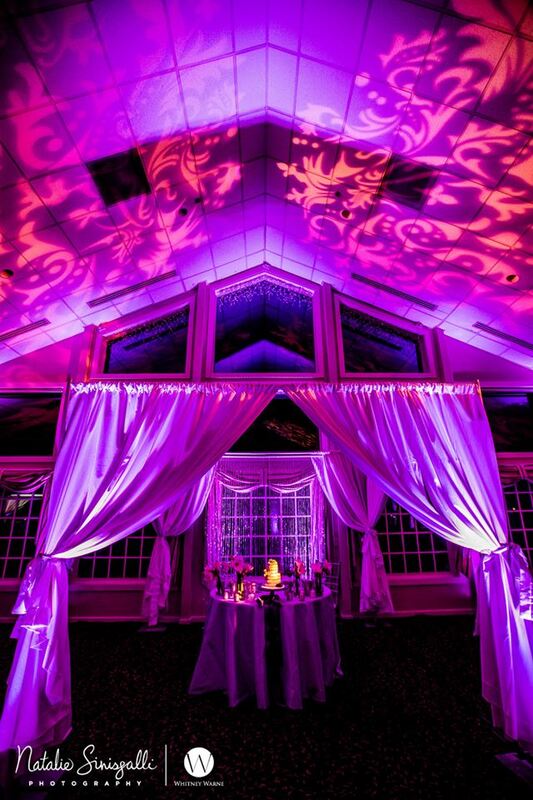 Our uplighting feature is easily our most popular wedding reception design element. With unlimited color choices, we make it easy to express your event's palette in amazing fashion. The space will transform... jaws will drop... perfect. See your name in lights! Few services we offer make the immediate and bold impact that a monogram or image projection does. Personalize your event with this amazing effect! We will even create the artwork for you. Our computer-controlled spot lighting will take your reception's dance floor to whole new levels of elegance, impact and drama. This feature is an incredible way to highlight the most important moments of your day, like a spot-lit first dance. Then, your guests will be awed when the dancing begins. Let us turn your celebration into an red carpet event! Encore is bringing the bling to your reception! If you want the ultimate WOW factor, here it is. 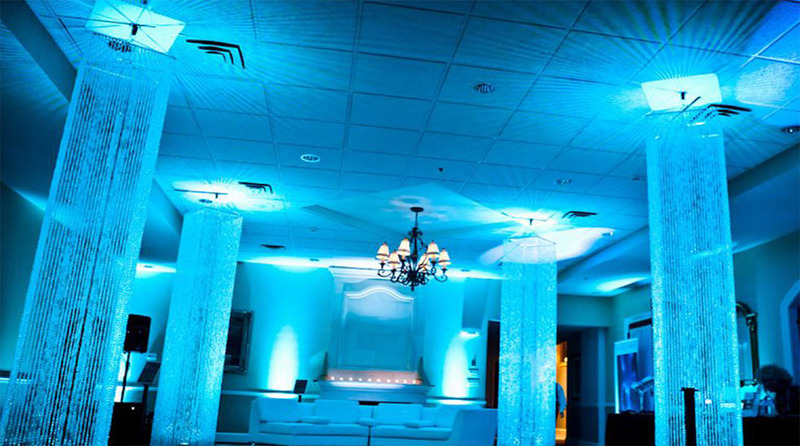 Our LED Color-Lit Beaded Crystal Columns can be suspended in nearly endless sizes of venues and spaces and, really, have to be seen to be believed. Why let a dance floor just be a dance floor? Why should the roof of your tent be boring? Make it a canvas! Add depth, dimension and color to your dance floor, tablescapes, ceiling, or any space of venue with Encore's Wash Lighting. Imagine a magical first dance, under an incredible sky of stars... indoors! The lighting experts at Encore bring the night sky inside your venue with our Starry Sky Projection. Make a wish! Hey, you made a big investment in your cake! Let's make it stand out! This simple and inexpensive lighting design will add tremendous impact to this most important of wedding traditions. It'll look so good, you may not want to cut it! Some people spend thousands of dollars on centerpieces for them to go unnoticed. Pin-spotting them is a great way to light them up and make them the focal point of your tables. Ok, now we are getting serious! Let our huge variety of trussing options, from awesome dance floor towers to incredibly impressive "flying" structures, take your lighting design to the next level. Let's turn your party into an EVENT!